Make a healthy whole grain barley pilaf recipe with wild rice and cranberries and flavored with orange juice, a touch of salt and fresh parsley, with chopped walnuts for extra texture and protein. Barley pilaf is a nutritious and high-fiber side dish or vegetarian main dish. Or, use this mixed grain pilaf to stuff an acorn squash or another oven-roasted fall squash for a colorful fall or Thanksgiving dinner entree. In a medium saucepan with lid, bring water to a boil. Add pearl barley, wild rice, and salt; return to boil. Reduce heat to low, cover and cook about 40 minutes or until barley is tender but chewy. While the barley and wild rice mixture are cooking, pour the orange juice over the dried cranberries and set aside. Drain any excess liquid from cooked barley and rice mixture. Place barley and wild rice in large bowl. Drain cranberries, reserving 5 tablespoons orange juice. Toss cranberries with barley and wild rice. Mix reserved orange juice with lemon juice and onion. Whisk in olive oil and season to taste with salt and pepper. Pour dressing over barley mixture. Add chopped parsley and toasted walnuts; mix well. 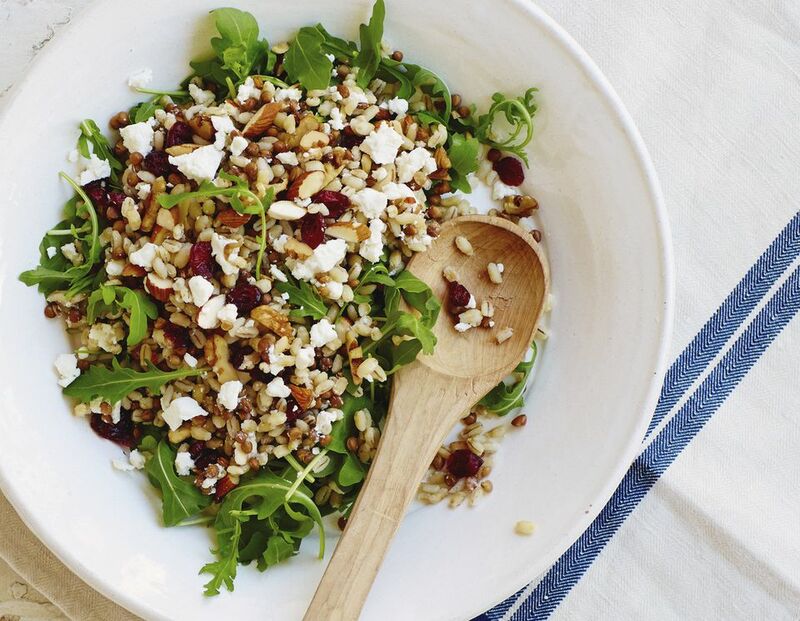 If you're not eating vegan, you may want to top your cranberry pilaf off with a bit of crumbled feta cheese; or, to turn it into a salad for lunch, plate it with a few greens, either on a bed of butter lettuce or romaine lettuce leaves, or, some mesclun greens, arugula or kale italia.